Rory McIlroy is on course to be crowned European number one for 2015 after moving to within a shot of the lead at the World Tour Championship in Dubai. Current Race to Dubai leader McIlroy's seven-under 65 moved him to 15 under as England's Andy Sullivan fired a 68 to stay one ahead after three rounds. Danny Willett, second in the rankings, is sharing sixth spot on 11 under. 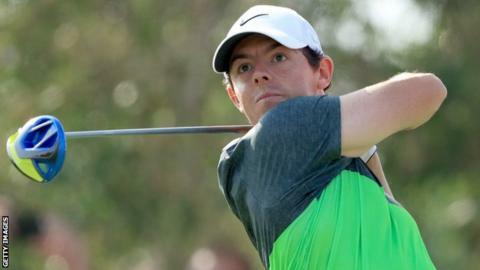 McIlroy must finish ahead of Willet in the Dubai event to retain his order of merit lead over the Englishman. Justin Rose's hopes of lifting the Race to Dubai title appear to be over after a dismal 78 dropped him 15 behind Sullivan. World number three McIlroy has a lead of only 1,613 points over Willett, with Rose more than 600,000 points further back and needing to finish second or better to have any chance of taking the end-of-season crown. Overnight leader Sullivan, the only player to win three times on the European Tour this season, holed a 10-foot par putt on the last to retain his advantage after over-clubbing with his wedge approach shot. McIlroy began the third round four shots behind Sullivan but surged to the top of the leaderboard with eight birdies and one bogey in 15 holes at Jumeirah Golf Estates. His three successive birdies from the 13th saw him take the outright lead for the first time but he failed to take a number of other chances including a missed four-footer at the last as Sullivan picked up shots at the 15th and 17th to regain the advantage. McIlroy was left frustrated by his missed putt at the 18th after a day of outstanding ball-striking. "You can't walk off this golf course having shot seven under and not feel too good about yourself but I felt like the round could have been a lot better," said the world number three. "But I'm playing lovely and I'm in the position where I want to be going into tomorrow." Despite all his successes in recent years, including four major triumphs, McIlroy insisted that a third Race to Dubai title would be important to him. "It's my last round of the season and I want to make the most of it," added the 26-year-old. "I would love to finish the year on a high by winning the Race to Dubai and more importantly, win this tournament." Sullivan, cheered on by 30 supporters from his club in Nuneaton, insisted that he was looking forward to battling with McIlroy on Sunday. "There's no pressure on me. I'm not expected to win," said Sullivan, 28. "I'm going to go out and play golf and enjoy watching the (former) world number one play golf." Willet's order of merit title hopes appeared to be fading after a slow start to his round but a 30-foot eagle putt on the 15th helped him play his final five holes in four under. "I don't think we are going to see Rory coming backwards so we need to shoot a good round tomorrow and see what happens," said Willett.